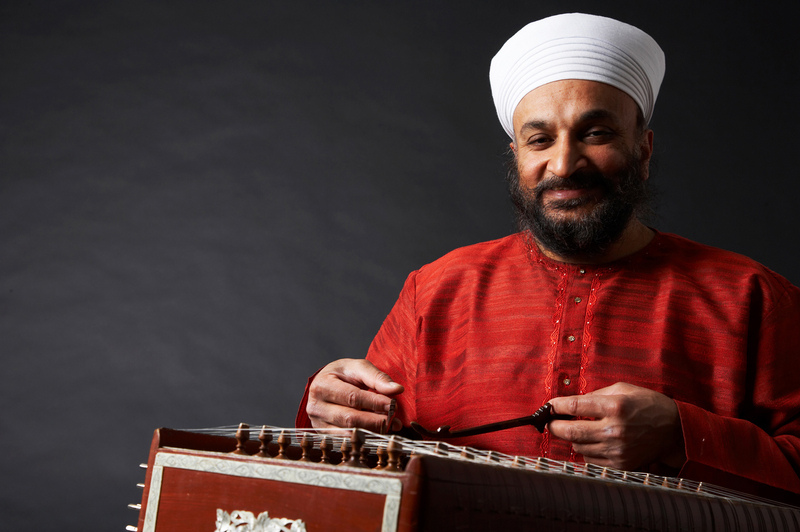 Kiranpal Singh, classical Indian santoor and tabla player for hire. Classical Indian recitals, also suitable for Indian weddings, festivals, corporate events with an Indian theme. Kiranpal has gained respect and admiration for his various performances on santoor and tabla in the UK, Europe and beyond, in recitals, festivals and lecture demonstrations. Admired by both audiences and critics, his mastery of the advanced techniques of the instrument, combined with a creative flair and spontaneous imagination, has developed a recognizable individuality in his performances. He performs regularly in collaboration with musicians from other musical styles. 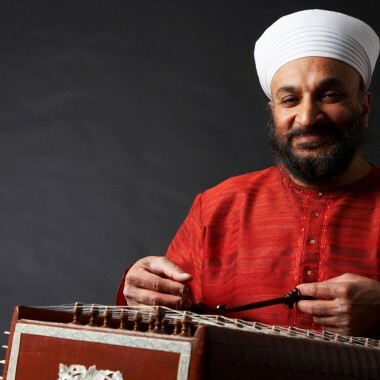 This, in turn, has led him to be sought after as a co-leader of ground-breaking developmental and cross-cultural projects, whilst continuing to advance the presentation of Indian Classical music to ever widening audiences through his solo work. Born in Dar-es-Salaam, Tanzania, East Africa, in 1957, Kiranpal grew up in a Namdhari Sikh family with a strong musical atmosphere. The family later moved to England. 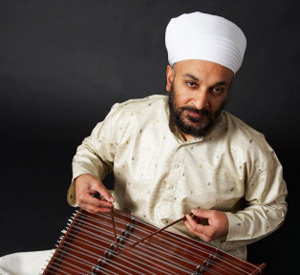 Kiranpal Singh’s first musical study was the tabla, which he pursued under the guidance of Shree Ripdhaman Singh of Punjab Gharana from 1970 to 1977. His potential as an artiste of the highest caliber was recognized by His Holiness Sri Sat Guru Jagjit Singh Ji Maharaj, spiritual guide and leader of the Namdhari Sikhs, on a visit to the UK, who arranged for Kiranpal to be sent to Bombay to study santoor in the traditional way under Pandit Shiv Kumar Sharma. 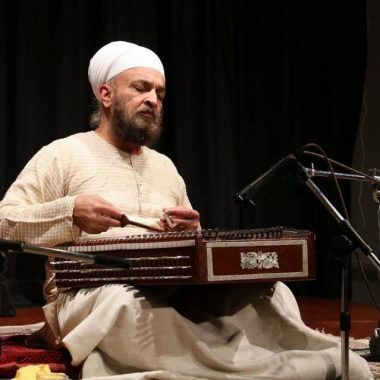 He completed twelve years of study as an outstanding student, mastering the subtleties and intricacies of the instrument in such a commanding way that he is now recognized as a leading disciple of Pandit Shiv Kumar Sharma, and in his own right as the principal santoor player in Europe. 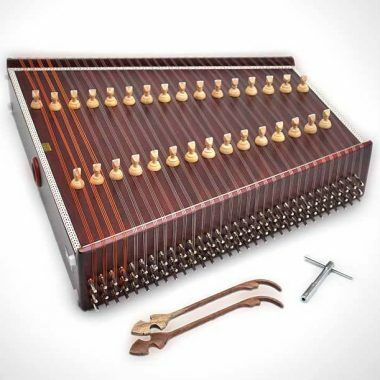 The santoor is an exquisite 100 stringed instrument unique to the Himalayan valley of Kashmir. It has been a folk instrument there for centuries but in the last 40 years it has risen to new prominence in classical Indian music, largely due to the prominence of Pandit Shiv Kumar Sharma, Kiranpal’s tutor for 12 years. Western equivalents include the hammered dulcimer and the cimbalom, found widely in Eastern Europe.